The most advanced energy storage system. CellCube intends to be a fully integrated producer of vanadium, vanadium electrolytes and vanadium redox flow batteries for energy-centric markets. We put 15 years of research and development into CellCube to provide you with a top-notch energy storage system. Our Vanadium-based technology is known to be state-of-the-art in the power-centric market. We are the current leader when it comes to the commercialization of sustainable storage solutions with more than 130 installations in the field. Customers from all over the world have been successfully operating CellCube for over 10 years. For more than 5 years, the product has been running a continuous test with undisturbed operation that reaches over 10,000 cycles - the equivalent to 28 years of daily cycling. Experience the power of redox flow technology. Based on the vanadium redox flow technology, CellCube allows for clean, emission-free and fast energy supply at all times. A stable power supply, for example, in combination with renewable energy sources, is ensured in every climate zone at all times. The use of vanadium electrolytes increases the overall safety and battery life associated with energy storage systems. Vanadium is non-flammable, non-explosive and is not subject to any loss of reactive material. CellCube allows a practically unlimited cyclization with up to 80% efficiency and a depth-discharging capacity of 100%. With its simple and independent scalability in power output and storage capacity, CellCube is the leading energy storage system for individual industrial applications. CellCube provides e-mobility solutions for off-grid applications and micro grid power supply in regions without a stable power grid. No matter how remote the location, we gladly service your CellCube for you. Level of required maintenance dependent on your individual technical needs. Real time data and analytics provides us with the most up-to-date status of your CellCube 4 hours a day. How many deployments does CellCube havE? We have deployed more than 130 CellCube storage systems globally to date. ARE THEY PILOTS OR ARE THEY COMMERCIALLY ACTIVE? We started selling CellCube branded ESS systems in 2008. In the following early years, our main focus was on application specific pilot projects. About 30 percent of installed CellCube systems are in early adoption and commercial use. Since then, CellCube has found continued success in commercial driven BtM projects, primarily in DER applications (mainly EU, Solar plus storage as demand charge and high energy price reduction). We have further systems deployed from Siberia to Vietnam to Australia and South Africa in micro grids (either grid connected or diesel gensets + photovoltaic systems + energy storage hybrids). On the other hand, our larger unit instalments (200kW to 500kW, 3-8h duration) serve in grid pilot projects at major European utilities (applications: Frequency regulation/Primary Control Reserve, voltage/grid-quality support, capacity market, and community size micro grids). We calculate a combined 3M+ operational hour experience in the installed base. HOW IS CELLCUBE DIFFERENT FROM COMPETITORS? CellCube is the first miner of vanadium that also packages the material into a storage product. As a vertically integrated energy storage system provider, we function as “one stop shop” for sustainable storage solutions. is the transfer from Lithium to Vanadium approaching faster than we think? Yes. The tipping point for commercializing vanadium redox flow batteries is coming earlier than expected. Energy storage markets are changing from a need for power-centric energy storage in large grid applications (frequency regulation, transmission & distribution grid quality support, etc.) to a much larger energy centric storage market. This includes everything from peaking power conversion to storage, multi-hour distributed energy resources to off-grid applications. 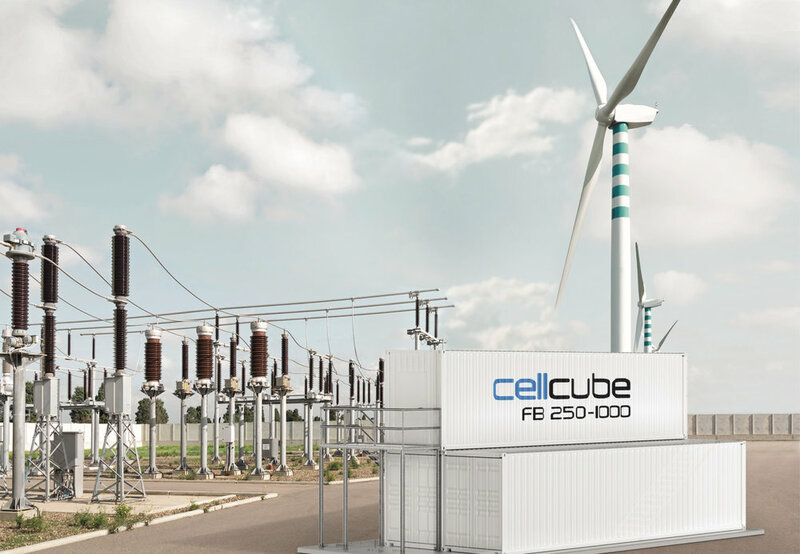 CellCube rivals other company's approach towards stationary energy storage market share. In energy centric market segments (like much larger than the size for power centric applications in terms of MWh’s installed), CellCube’s flow batteries show substantial advantages for long-duration storage following down the capacity market segment merit order in price/kWh and demand for more than 4 hour durations, thus making a viable case for flow deployments. Enerox, (formerly GILDEMEISTER energy storage) is a globally active service provider in the renewable energy and storage sector with headquarters south of Vienna (Austria). From development, construction and operation of large turnkey energy storage systems (utility scale & microgrid) to comprehensive energy solutions for industrial applications to increase energy efficiency, Enerox is our partner of choice. EnerCube, (formerly Jet Power and Controls) is a leading-edge provider of custom and off-the-shelf electrical equipment and systems. It has been providing innovative and high quality products for over ten years to heavy power users, pipeline companies, refineries, manufacturers, municipalities and infrastructure providers. It offers a “one stop shop” to its customers in terms of complete turn-key engineering & electrical solutions and equipment. Its key products include electrical switchgear, motor control switchers, and solar power inverters. POWERHAZ ENERGY MOBILE SOLUTIONS INC.
PowerHaz designs temporary and mobile power products that are used on industrial and construction sites for shut- downs, turnarounds and large-scale construction demolition. Companies need a variety of power products that are safe, durable, versatile, easy to use and ready for hazardous (classified) locations or non-hazardous environments. PowerHaz recognizes customers’ needs for temporary power products and has developed expertise in designing and manufacturing such products that accomplish the job in a safe and secure manner.